They went just about everywhere that just a single season! I would be exhausted after all of that and I think I have lots of energy. I guess everyone has their own travel trip endurance. I’ll be spending some time out in the Lake Mead Basin and neighboring canyons towards the end of the month. Hi Steve, thank you, that’s true, good point. I guess I hadn’t thought too much about the sheer number of national parks they visited. It may not seem quite as daunting a journey, or it may seem more daunting when we consider that they were on the road from early April through October. In addition, my father always moved at a slow pace, taking plenty of time all along the way. On one very prominent landscape photographer’s website recently I read that he made a point of not photographing in the national parks. He implied that it was cliche and ineffective from a conservation standpoint to do so, in a sense even implying a put down of Ansel Adams and of course my father. It may have been cliche by the time he came on the scene twenty years after my father and forty years after Ansel Adams, but it wasn’t cliche at all in my father’s day. My dad’s landscape and architectural photography of the national parks was sanctioned by Washington D.C. leaders starting as high up as President Gerald Ford. Dad, like Ansel Adams before him, was interested in helping to expand many of the national parks, as well as influencing public opinion toward changing national monuments to national parks. Also, my father and other leading conservationists of the time including Ansel Adams and David Brower were greatly concerned about the direction of development that the National Park Service took in the national parks. They were building super highways and other high standard roads, resort-like facilities and otherwise over-improving and destroying the very land that the parks were originally intended to protect. Buildings and trails were not made nature friendly, but instead were designed by engineers who intended to assure that the most sedentary people could drive or easily stroll to all major attractions rather than having to get close to the Earth or walk any distance to see anything. Many of my father’s early photographs over time made a significant impact on national park policy. It is fortunate that the improvements were reigned in some in the 1950s and 1960s because today the National Park Service can’t afford to maintain the facilities they do have. Steve, I hope you have a great trip to Canyon Country. Happy trails. How many of these adventures were you on? You were in your early teens then? There seems to be a new breed of “pro” out there, they’ve probalbly been there all along and we are just being exposed to them more now, that thinks that they enhance their own work if they denigrate or belittle others. Have you ever figured out how many miles your family has traveled? Hi Greg, thank you for your questions and interesting observation of some of the “pros” today. I too have noticed a in some a significant amount of arrogance and need to put down other photographers to build themselves up. Unfortunately for that type of landscape photographer and fortunately for the genre, I doubt history will be very generous to them. It is precisely Ansel Adam’s generosity, kindness and all around jovial and friendly nature that contributed significantly to the development of his legendary status. Same goes for my father. Humility, approachability and general likability caused other photographers and industry people from all quarters to be major advocates for him and his work. It still goes on today. The help and inspiration my father spread around will not be soon forgotten. To answer your question about when and how many of my parent’s travels I participated in, I was born in 1965. So “Formations From Bryce Point” and the entire Southwest photographic season of 1963 that produced many of my father’s most renowned images was before my time. The battle over Dinosaur National Monument was also obviously before my time, as were the North Cascades project, the forming of Redwood National Park, the founding of Point Reyes National Seashore, “Navajo Wildlands,” the saving of the Grand Canyon from dams and many others. As I have mentioned previously here on this blog and will discuss more completely in future blog posts, at age 2 1/2 I became the youngest person ever to ride horseback into the wild canyons of the Maze, Canyonlands when my father was working on “Slickrock,” Dad’s book with Edward Abbey. I was raised partly in the desert and participated in many of the trips that were later made famous by “Slickrock.” I was only three when David Brower resigned from the Sierra Club and the heyday of Sierra Club books ended as the Exhibit Format Series retired and the Sierra Club Board cut the publishing program way back. Dad was the primary illustrator of “Alaska: The Great Land,” a Sierra Club book also published in the early 1970s. In the 1970s and 1980s Dad moved on to work with David Brower and “Friends of the Earth,” as well as with “Earth Island Institute” and many other environmental groups as he had all along. He still traveled just as many days a year. He was usually on the road from April through October every year and some years during many of the other months. I was on many of the trips, especially when I was young before I started school, but just as often my mother and I stayed home. I have not yet added up all the mileage, but that is a brilliant idea. I believe I do have all or most of the vehicle travel records and could probably come up with a fairly accurate number with some digging. I’ll let you know if and when I get a chance to do such a calculation. It would be an interesting figure to have for my book. I thought you were a little older. Why you’re just a whippersnapper. I have found that by sharing I learn more than if I just tried to keep everything to myself. Much as you do with your work. I enjoy your writing and look forward to your book. I would like an autographed copy when available. Hi Greg, thank you for your compliments, you know, me being a whippersnapper and the sharing that I do in my work. I look forward to the day that I can deliver you an autographed copy of my book, but it may be quite a while. I seem to be bogged down in keeping ahead of the wolves right now, much like many others it appears. Who was this photographer or where is this mentioned? If a conservation photographer is photographing something before it’s been made a national park or monument why would it be ineffective? Hi Steve, thanks for returning. I cannot specifically mention his name yet at this time. I am working on a strategy for acclaimed, accredited, credible rebuttal to several of his claims in which he has indirectly put down my father. I can only give you a hint that I suspect, I don’t know for sure, I merely suspect that he is the only photographer who disagrees with my statement that my father participated in more environmental campaigns than any other photographer. When I started making that claim I called around to a number of photographers who might have a competitive shot at that title with the intent to solicit their blessing or objection. I had never heard of this particular landscape photographer in 2002 when I made the phone calls, but one of Ansel Adam’s heirs tipped me off that this particular photographer had done a great deal of environmental and conservation photography and a lot of good as a result. This particular photographer is the only one who did not return my call. He has made a particular point of aligning himself with Eliot Porter and emphasizing his “life long” friendship with Eliot Porter. It is amusing to note that in the late 1990s when Eliot Porter was not well and scheduled to teach a workshop at the Truckee Photographic Workshops, they called my father to take Eliot Porter’s place. They did not call the photographer who claims to be carrying on Eliot Porter’s tradition. This photographer also lives in Beverly Hills and jet sets around the globe to capture images. To be fair, I must say that his photographs are very high quality, some of the best ever made. I have also heard, not experienced myself, merely heard from several sources that he is quite arrogant. I only regret that I have not had the opportunity to meet him–a choice that he so far has made by turning the cold shoulder toward my father and me. If we met we might like each other. His work is certainly to be respected. Recently on his home page, or perhaps the home page of his blog, I am somewhat confused as to which is which, he said that he preferred to work with private organizations like the Nature Conservancy and with local land trusts rather than photographing in national parks. He went on to say a few cutting remarks about photographing in national parks and how it is not as effective for conservation. I just now checked again and he has removed all of that and put up a quote by Ansel Adams. The irony is that a decade or two ago he wrote a book about American Photographers and the national parks, in which he glaringly omitted my father’s photography during a time period when my father’s work was quite prominent, especially among those interested in conservation. He is very good at self-promotion and marketing, less to the mainstream and more to wealthy collectors and museums. He has managed I imagine through money, good connections and sheer strength of personality to align himself with many of the top museums in the country. He is prolific and has been widely published in many books. Am I jealous? Absolutely. If we are all in it for the sake of the environment, then why couldn’t we all work together and help each other on behalf of the planet? But in many conservation circles it is just as important who gets credit for doing good work as it is to do good work. My father’s philosophy always was to paraphrase the quote I don’t know the author of, “There is no end to the good that can be done as long as it doesn’t matter who gets the credit.” The Eliot Porter establishment, including some of the galleries that carry his gorgeous dye transfer prints, have always made it a policy to pretend that Philip Hyde does not exist. This particular photographer I am referring to is faithfully carrying on that tradition, to which by the way, my father never objected. My father said, “I don’t want to be distracted by fame.” Dad liked that he was the lesser known underground landscape photographer who quietly went about working to save wilderness and living a simple life close to the land rather than spending the majority of his time schmoozing the art establishment. I am probably stepping into a war I can’t win, a class war of sorts. I am “tilting at windmills” as my father used to say. I seem to be good at getting myself into these David and Goliath situations. I am not sure it is the best way to go about my task. I would certainly prefer to align with them than fight against them, but it irks me that Dad doesn’t get the credit he deserves and they continue to push his work aside as if it was and is unimportant. This will change. Mark my words. 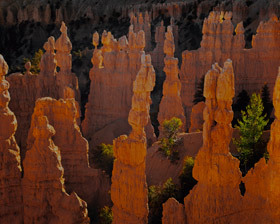 I remember back to some of your first comments on my blog–they were on images from Bryce Canyon–when you talked about the intense luminance in this canyon. This image really portrays that trait well, and is beautiful. Its interesting to read about your parents’ travels to this area, and the way they write takes me there almost immediately–that’s powerful wordsmithing! Oh, and PS–the next time you’re in LA, please do call if you have the time. It would be wonderful to meet you in person! Thank you Greg. Both of my parents were indeed good at describing place and capturing the mood and essence of the locations Dad photographed, with words as well as images. I too would greatly enjoy meeting you and will most definitely call in September when I am there. Didn’t I call you in April when I was there? Maybe I decided it was too far out to Riverside to try to connect with you on that trip. It was a whirlwind and mainly focused on Santa Monica. I did visit PJ in Korea Town and Richard Wong in Pasadena. With all of that info I know who you’re speaking of but it’s a title definitely worth the efforts by each side so you have a long road of endless work to do. We all hope for the best and Phil Hyde does need as much recognition as he can get. He’s very fortunate to have a son that strives to do this. Most of us that try to earn or earn a living from landscape photography have some kind of rival who makes life harder, I certainly do. This pushes us to work harder. On a side note, I recently spoke to David Muench and he had good things to say about your father. He said he wrote some good things too but I can’t remember where but you probably have already read if it’s out there now. Hi Steve, I appreciate your perspective, especially what you say about competition driving me/you/anyone on to greatness. I have thought about that too. It can be a great inspiration to have top notch competition. In this case I have perhaps the most worthy competition in the business. It is most definitely a healthy challenge to set a big goal to compete well with him. By doing so I suppose the environment gains. Nonetheless it still remains the case that the environment would benefit more if we worked cooperatively. This is one of the discoveries of modern mathematics: that cooperation is actually more effective in capitalism than competition. Everyone does better, makes more money, does more good and accomplishes more when in cooperation. You may recall that is part of what the film “A Beautiful Mind” was about, what the main character discovered in the mathematics of economics that earned the Pulitzer Prize. Competition is certainly not all bad and can be healthy, but is not as great as many people believe. Regardless, your point is well taken, sometimes it comes about that people wind up in competition and that’s just the way it is. As far as David Muench goes, he’s a class act. I like him. He, my dad and I had a very nice conversation when we called him about my environmental campaigns claim. He expressed his admiration for my father’s photography and conservation work. I am not familiar with anything David Muench has written about Dad. Please let me know if you run across it again. I have enjoyed the comments as much as the article. Hi Sharon, People’s comments are great on this blog post, particularly Steve Sieren’s. I suppose I unleashed a bit here and wasn’t sure if people would find it interesting, inspiring or putrifying. I’m glad you enjoyed reading. Thank you for the positive feedback.